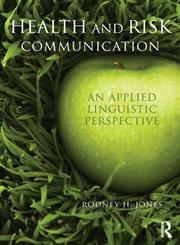 The Title "Health and Risk Communication An Applied Linguistic Perspective" is written by Rodney Jones. This book was published in the year 2013. The ISBN number 0415672600|9780415672603 is assigned to the Paperback version of this title. The publisher of this title is Taylor & Francis Group. We have about 148474 other great books from this publisher.